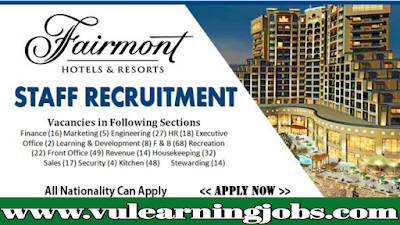 Fairmont Hotels Careers & Jobs 2019 At Fairmont Hotels and Resorts, we offer our guests the best hospitality experience at each of their destinations. And we know that, to give the best of our guests, we first need to give our employees the best. This is the reason that you will get extraordinary work opportunities in North America and the Caribbean, Europe and Africa, Middle East and Asia Pacific as well as industry-leading training, career development, recognition and awards. Fairmont Hotels and Resorts is a celebrated collection of hotels that include historic places such as The Savoy of London, The Plaza of New York and Fairmont Peace Hotel of Shanghai. Our teams are guided by the values ​​of respect, integrity, teamwork and empowerment; We apply the highest ethical and quality standards, treat all associates with impartiality and dignity. A community and environmental leader, Fairmont is also considered for its responsible tourism practices and award-winning Green Partnership Program. Awaiting an exciting future!